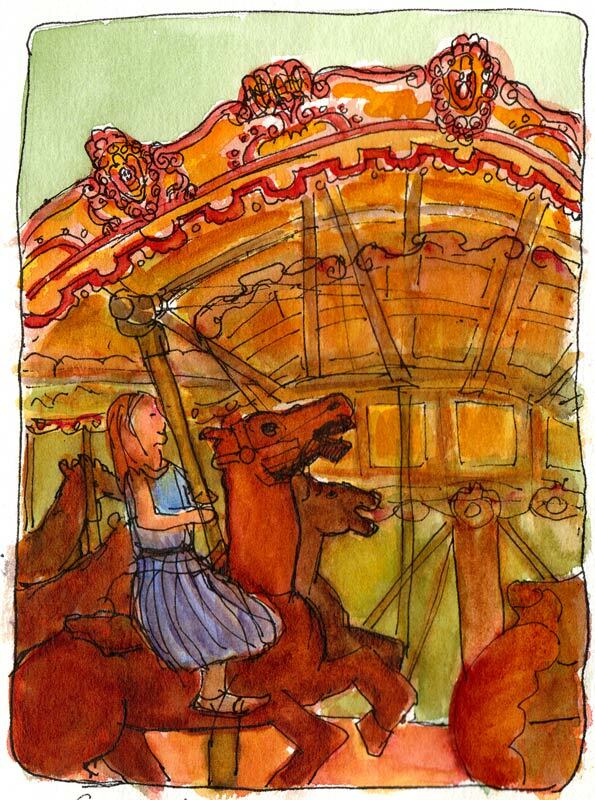 Tilden Park Carousel, ink & watercolor 5x7"
I almost didn’t post these sketches from the Tilden Park Merry-go-round because I was so frustrated drawing them. But I think it’s interesting to see when others post things that challenged them so here you go. I try to find something positive in work that doesn’t succeed overall. The one above was the last one I did as I was leaving. I really like the trees in the background and most everything else EXCEPT the messed up shape of the building that houses this wonderful 100-year-old carousel. Carousel structure, ink & watercolor, 7x5"
I did the one above sitting on a bench inside the building trying to sort out the perspective and the way the whole thing fits together. Meanwhile the smells of burning popcorn and greasy hot dogs were making feel rather ill. I really struggled but in the end I think I got the understanding of what is a merry-go-round and how it works, though you can’t tell from this mess. Another one that I struggled with. The little girl calmly rides while the horse seems to be expressing my struggle. And boy are the perspective and ellipses way, way off! 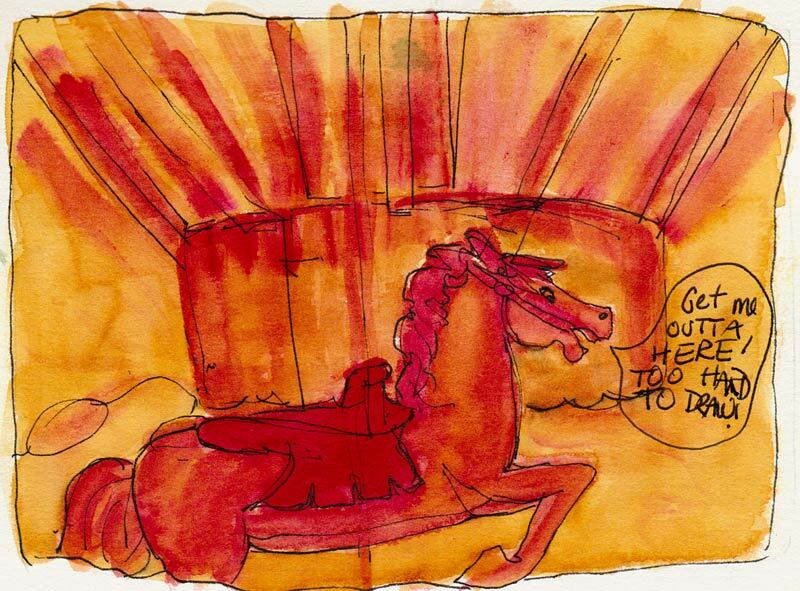 Another quickie with the horse expressing my feelings: “Get me out of here! 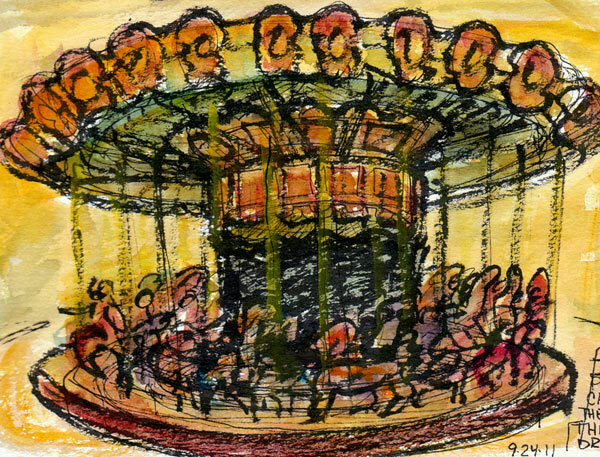 It’s too hard to draw!” My friend Cathy did some nice sketches of the carousel, posted here on our Urban Sketchers blog. I’m pretty sure I rode on that carousel when I was about 7! So I think you captured the image pretty well! There’s a carousel in a local mall and I haven’t tried to draw it because it keeps starting and stopping. Brave attempt! Bravo. I prefer “messed up shapes”. 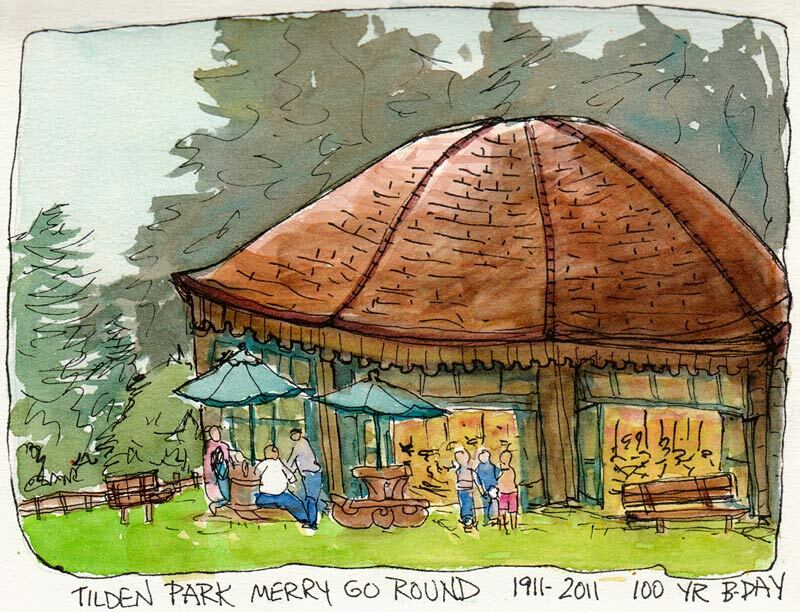 Your sketches give a good expression of both place and experience. I know what you mean Jana, I’m always disappointed with “imperfections” in my own work – but they are often what I find most appealing in the work of others. It is perhaps those “imperfections” that help convey an experience and express personal character rather than merely record an observation. A good friend continually tells me that “neat is boring”. I do appreciate your posting the challenges. I feel like I always learn from you! You definitely chose a difficult subject! Before reading your words, when I first saw that top image I thought, ‘wow, what an interesting building!’. I loved the shape of the roof, it made it fun. You know, there’s just so much going on in a carousel…even taking meaningful pictures is a challenge. Perhaps focusing in on one horse (like one of your sketches? ), but then you lose the dynamism of the whole. I don’t know; keep on sketching! that I am re-reading and that is full of that same 8-12-year-old world where you run everywhere in new summer sneakers.